One of my daughters recently had an answered prayer in her life. My 9-year-old daughter had misplaced her iPod. She was given the iPod for Christmas and was SO excited because she had been wanting one for a long time. Well a few weeks ago it was nowhere to be found. She looked and looked and asked everyone in the house if we had seen it…no one had. I knew it had to be somewhere in our house and that it would turn up eventually. She was sure that our toddler had something to do with the mysterious disappearance…. Well a couple of weeks had passed and still no iPod. One night recently my daughter came in and asked if I had seen the iPod anywhere. I told her that I still hadn't found it. She looked at me and said that she had prayed about it and asked God to help her find it. I told her that was a great thing to do. Literally, about 3 minutes later she comes running in holding up the iPod. Right after she told me about her prayer she decided to look a little more in the family room. She went to sit down on her little sister's push car when she decided to lift the seat lid and check in the hidden seat compartment….guess what was in there!! 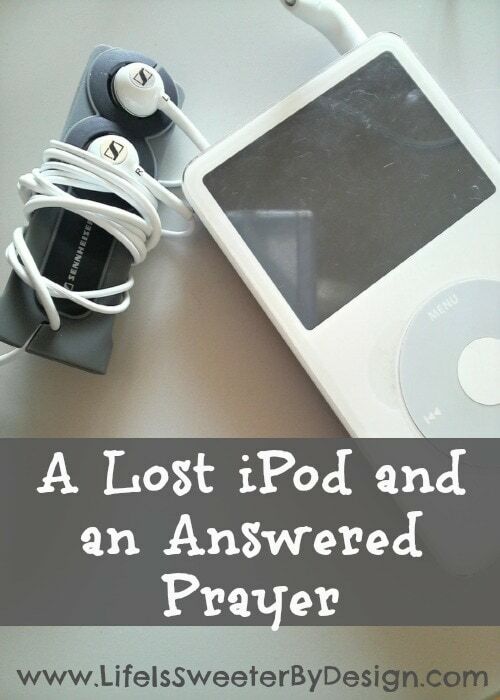 The best part of this story…she was more excited that God had answered her prayer then she was about actually finding the iPod. She acted almost like she couldn't believe that God had really answered her prayer. She kept saying….”He answered my prayer….He really answered my prayer!”. I reminded her that God loves her and hears her prayers. I let her know that God wants us to pray about whatever is bothering us, even if it is a lost iPod. I am guessing there are people who would disagree with me on this….saying that this is a trivial thing to waste God's time on. I agree that this isn't an earth shattering request….not compared to world hunger, human trafficking, etc. It was, however, an issue that was troubling my daughter's young heart. Philippians 4:6 says “Do not be anxious about anything, but in everything, by prayer and petition, with thanksgiving, present your requests to God.” This verse tells me that God cares about anything that is making us anxious….even a lost iPod. What are your thoughts on answered prayer? Do you think God cares about the smaller issues in our lives? I love when God shows up in the little things to show the little ones He loves them! That is one area I need to grow my faith in. I want God to answer and say “yes” to all my little things. He loves me, but the answer isn’t always yes. That’s hard for me. I am so glad your daughter found her iPod! I feel the same way LaVonne….it is hard to get a No or a very slow response! !